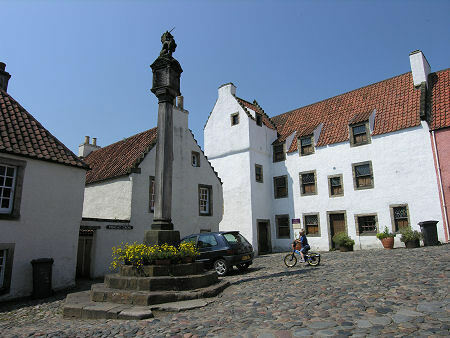 Arriving in Culross is something of a surprise. The village looks across the River Forth to the petrochemical works at Grangemouth, and sits between the closed Longannet power station to the west and the derelict Low Valleyfield colliery and the disused salt pans of Preston Island to the east. In this industrial landscape the visitor following the brown tourist signs to Culross Palace and Abbey is probably not expecting anything very special from the village itself. Which is why what you find such a shock. 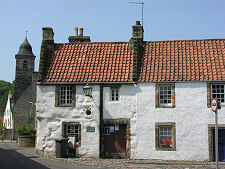 Because in Culross you find the nearest thing to a 16th century time capsule anywhere in Scotland. It's as if much of the core of the village was simply frozen in time. This effect is no accident, and what you see today is in large measure the result of the work of the National Trust for Scotland over a period of more than seventy years. 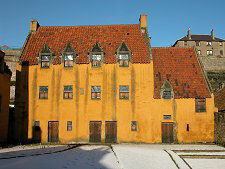 Highlights include the 1597 Palace, restored to its original mustard yellow render and wooden shuttered condition. It was actually more the local landowner's hall and dwelling, and still has a range of accompanying outbuildings and a "hanging garden" with wicker fences leading up the slope behind. 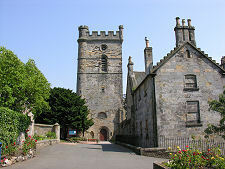 And on the hillside above the village are the remains of Culross Abbey. 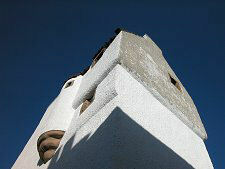 The 1626 Town House with its 1783 tower is also a showpiece. 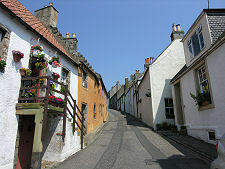 However, what really sets Culross apart as special is the way such a large part of the village is original, with narrow wynds (including the evocative and probably once descriptive "Stinking Wynd") and stunning buildings. Here you can begin to see what a 16th century village might really have looked like. The village had its origins in the twin forces of religion, at least until the Reformation, and coal mining. The abbey was founded in 1217 possibly because of the belief that this was the birth place of St Mungo and the site of an early church founded by St Serf. The monks later began to mine coal. 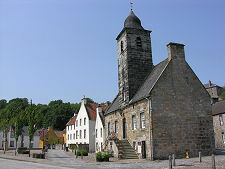 After the Reformation much of the abbey fell into decay, though the abbey church still serves as the parish church. In 1575 a unique new pit, the Moat Pit, was sunk by Sir George Bruce from an artificial island offshore in the River Forth, and kept drained by a continuous bucket system driven by water power from a dam on the hillside. 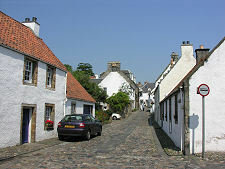 The coal was exported directly and Culross was once a very busy port. The coal was also used to provide heat for the village's second main industry, its salt pans. 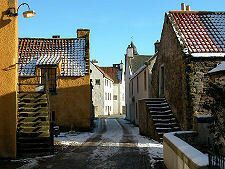 In the 1590s Culross produced more salt than anywhere else in Scotland. The profits produced by this trade and by the mine were used by Sir George Bruce to finance the building of the Palace. By 1750 the boom had ended. 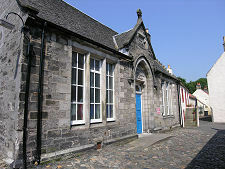 The Moat pit was flooded and destroyed in a storm in 1625, and later the stone from the pier, crucial to the village's prosperity, was removed to help rebuild the port at Leith. The fortunes of the village subsided through the 1800s, leaving, by 1900, "a decayed royal burgh containing many old houses". 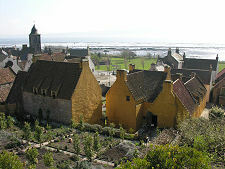 By the 1930s the world started to realise how special Culross was, and the NTS has been working here ever since. 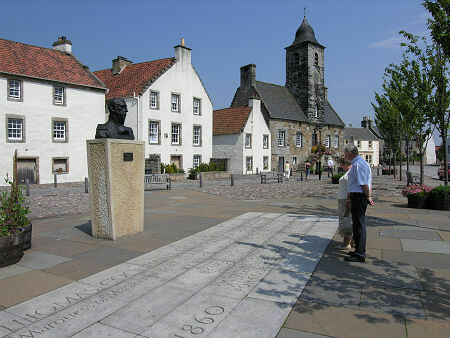 In the centre of Culross is a memorial to one of it's most famous sons, Thomas Cochrane, 10th Earl of Dundonald, Scotland's most outstanding naval hero.